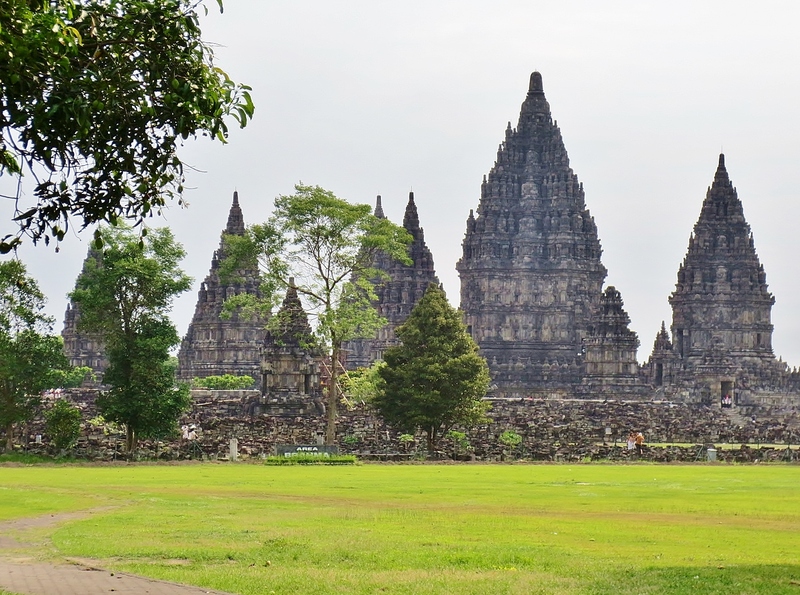 After my second trip to Bali, my friends and I had a short visit to Yogyakarta, where the Borobudur and Prambanan temples are just a few hours drive away. 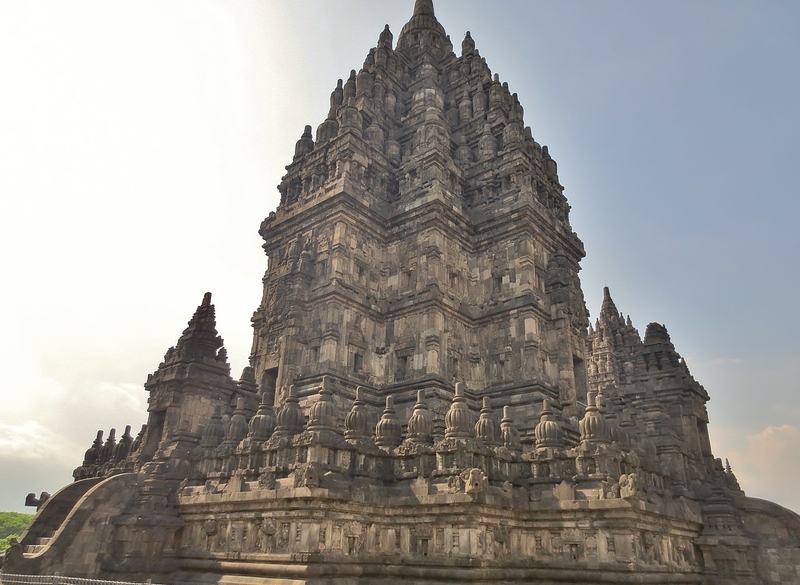 Yogyakarta, sometimes called Jogjakarta, is located in Central Java province of Indonesia. 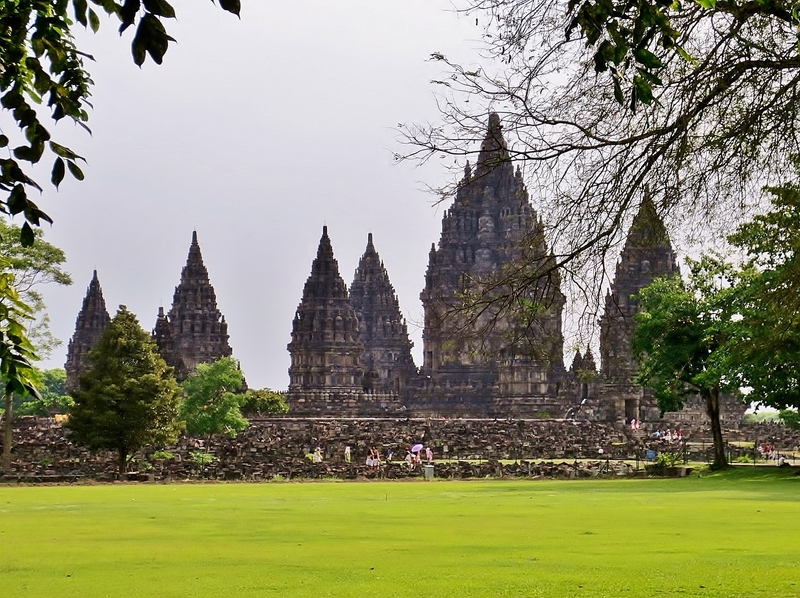 Both the Borobudur and Prambanan temples are in the UNESCO World Heritage Site list. 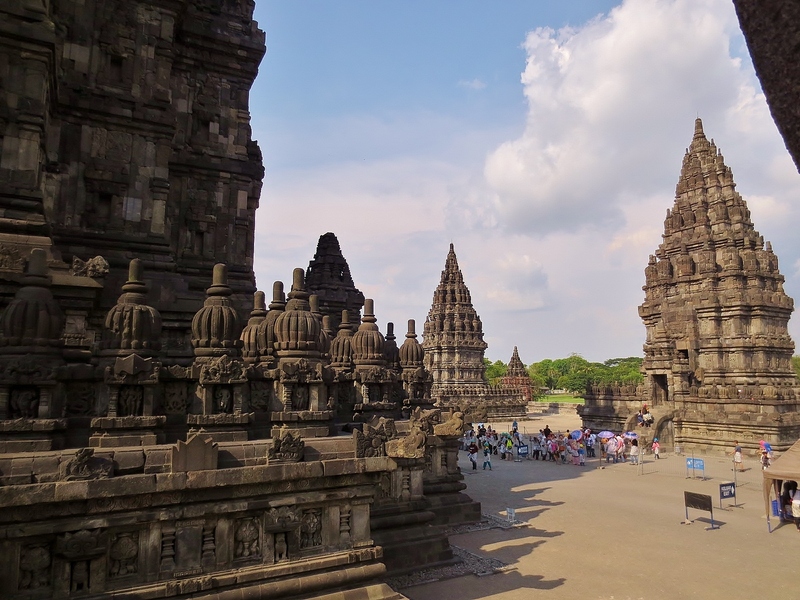 These prime tourist attractions are really a must visit when you get the chance to fly to Indonesia. Its magnificent and awe-inspiring architecture and engineering are just unbelievably incredible. The ancient stories and establishments like these never ceases to delight the curious 7-year-old in my head. We didn’t book any hotel, the short visit was as short as one day. . haha. . Upon arriving at the Yogyakarta Adisucipto International Airport, we immediately looked for a locker where we can leave our backpacks so we can enjoy what Jogja has to offer for less than 12 hours without a heavy load. There are many fixers outside the airport and at an affordable price, we booked a cab privately for the rest of the day while the driver served as the tour guide. I can’t remember how much exactly we paid but I think it should be more or less S$200. It may be too expensive for those who wanted to try the public transportation but since we only have a day to make the most of our visit, we don’t have much a choice and grabbed the cab, the expense was shared by 3 people anyways, so I guess it’s still not bad at all. 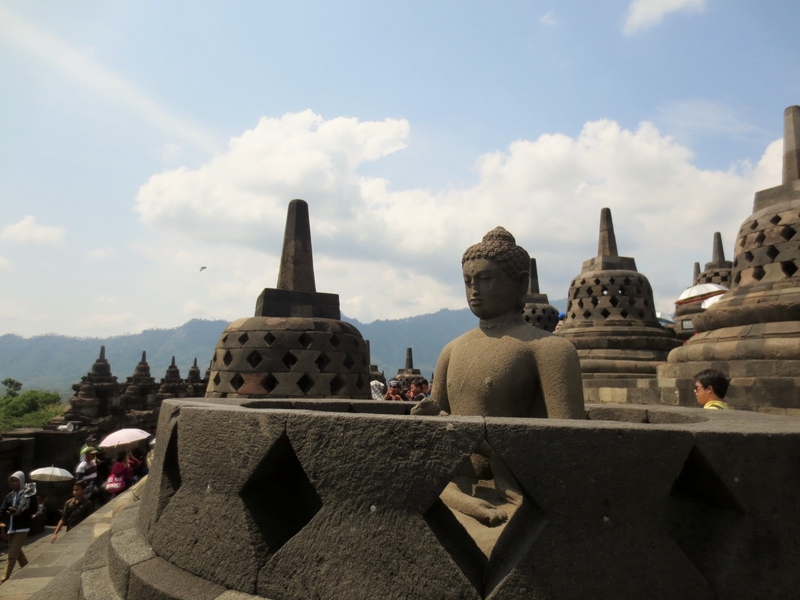 Our first stop was the Borobudur temple which is further from the airport. We paid a little more than 200k Indonesian Rupiahs for the admission fee, that gives you a free bottle of water too that you will probably need when you visited during a hot sunny day. Upon seeing the temple from afar, I was already speechless. . I have admired the beauty of the ruins in Siem Reap, Cambodia and expected to see something similar and not too surprising anymore. . But oh boy, my jaw really dropped upon seeing this spectacular temple. . 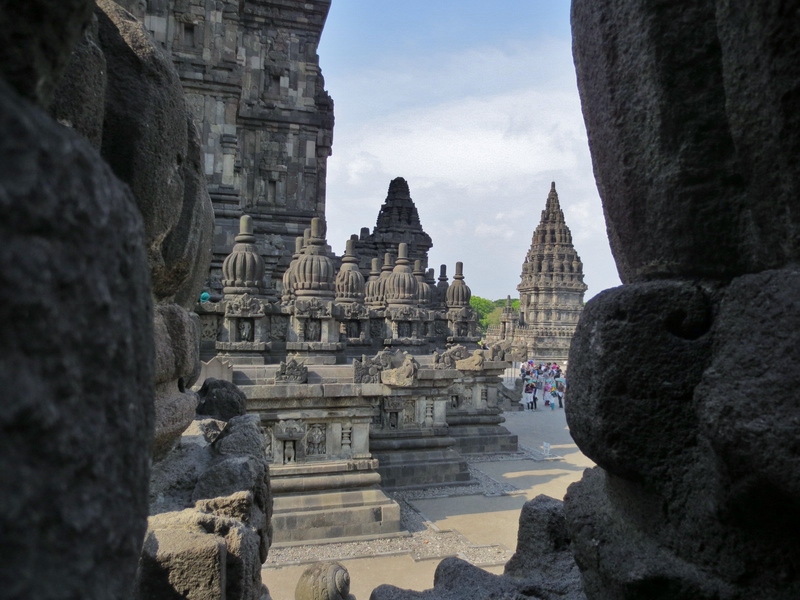 The sight of lots of giant bell-shaped stone structures makes it different from the temples I’ve seen and makes it as equally interesting as the Angkor Wat when I saw the latter for the first time. After the Borobudur temple, we had a quick tour near the Mount Merapi and had savory seafood lunch afterwards where I have tasted a fried catfish for the first time and regretted that I have not tried that in my 27 years of living. Haha. . I know, right? It’s a good beer match. . urgggh! 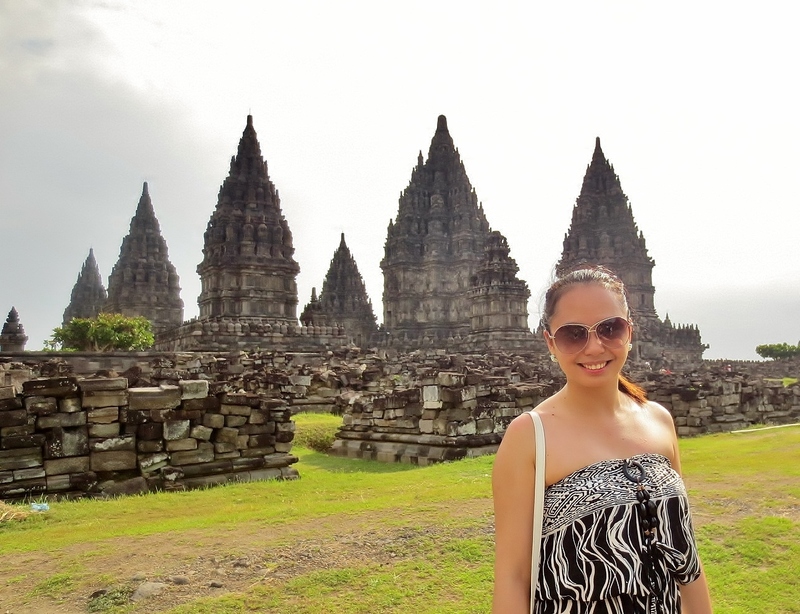 hehe. .
After lunch, we headed back to Yogyakarta for the amazing Prambanan temple. I imagine how these amazingly tall temples were created during the old times. They say that most of the temples of this UNESCO World Heritage Site has already fallen due to earthquake centuries ago. Even with the few left, I must say it’s still beautiful and awe-inspiring. Hard hats are required when you enter some temples as the unbelievable piles of giant stones are said to be not in a very stable condition. . With that in my head, I convinced my friends not to enter that temple anymore because I’m scared of the thought that even with a very tiny likelihood, it may collapse. So we just explored the insides of the more stable, tallest and widest one among all. Our trip to Yogyakarta was a very pleasant and memorable one. I admit it was really tiresome since we tried to compress the trip in less than a day. We bid farewell to Central Java, Indonesia as we flew back to Singapore afterwards.